We are officially not heading to parliamentary elections.The parliament approved today a second extension to its term for two years and seven month (31 months). That’s 943 days. 943. Again, 943. Most of the MPs voted for the extension while The FPM and Kataeb boycotted the session. While the extension move was very expected, several signs, especially in late August and the beginning of September hinted at the possibility of parliamentary elections happening this fall. But Lebanese politics are highly unpredictable. So what really happened these last two months? This week Future Movement showed Berri that they could still bypass any of his vetoes regarding the presidential elections by endorsing M8’s “hidden candidate” (Jean Kahwaji). And Berri responded by reminding them that he too is unpredictable and that no matter what happens, he still holds the keys to the Lebanese parliament and could postpone for them the elections in case they wanted to. And in the process, the Lebanese Forces discovered that they were yet again left alone with no real power. That was the situation in the first week of October. Then, on the 13th and 14th of October, three separate events proved that we were about to enter a turning point in Lebanon’s presidential/parliamentary politics. (1) Hassan Nasrallah’s remarks while he was visiting the Bekaa were at the same time too violent about ISIS and awkwardly silent about the parliamentary elections. If Hezbollah genuinely wanted the elections to happen, Nasrallah would have publicly and clearly supported the demands of his Christian ally. The Bekaa speech would have also been a good occasion to start the electoral campaign, since the parliamentary elections were supposed to happen in the next month. But Nasrallah completely ignored the subject and instead chose to keep the anti-ISIS media war alive. The comments were 100% about ISIS and 0% about the elections or even broad Lebanese politics for that matter (No mention of the presidential elections either). A bad result: A stronger Michel Aoun with a bigger parliamentary bloc (Making him more Hezbollah-independent which means that it would be easier for him to shift alliances or strike deals with his rivals). A worse result: M14 wins the elections. (2) The second development is about Amal and the FM. High ranking officials from both parties engaged in talks and the meeting was described as “positive” and aimed at extending the legislative term with “the minimum damage.” Two of the biggest blocs in parliament were already pro-extension. (3) Hariri had previously hinted that M14 was ready to drop Geagea’s candidacy, but it didn’t seem that serious until he met with the Maronite patriarch and publicly endorsed the election of a consensual candidate. The maneuver was simple: By throwing Geagea outside the presidential race and endrosing a consensual candidate, M14 appears to the Lebanese public as the coalition that is spending most of the effort regarding the presidential elections. 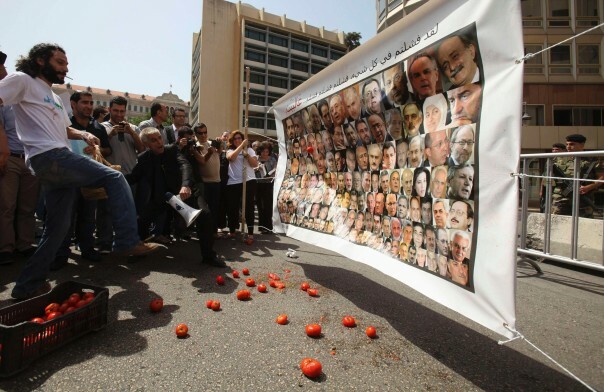 It puts pressure on Michel Aoun to back down but also gives the impression that the consensual candidate – once elected – would be an M14 sympathizer (since Aoun would be the last candidate to withdraw). Jean Kahwaji wouldn’t be “M8’s hidden candidate” anymore, but rather “M14’s proposed consensual candidate”. Properly speaking, it won’t be a win for M14, but it would definitively be defeat for Aoun. Is A ‘Consensual War’ Starting? Some rumors indicate that Jean Obeid might gather more support than Jean Kahwagi. Apparently, Obeid’s candidacy has the approval of Berri, Hariri and Jumblatt, which might mean that we could be heading (after the extension) to a “consensual candidate war”, with Obeid being supported by the “quadripartite alliance” Berri/Hezbollah/Mustaqbal/PSP (minus Hezbollah), Kahwagi being supported by Hezbollah, and Aoun being supported by himself while his Christian rivals seem to have no idea of what’s happening. انطلاقاً من الأوضاع الأمنية التي يمر بها الوطن والتي تؤثر بشكل واضح ومباشر على الحياة الطبيعية في مناطق واسعة وفي معظم المحافظات اللبنانية حيث انتقال الحوادث والإشكالات من منطقة إلى أخرى سبّبت سقوط الشهداء والجرحى لا سيما في مدن رئيسية تشكل عقدة المواصلات الأساسية بين المناطق اللبنانية من الشمال إلى الجنوب إلى البقاع. وبناءً على ما لهذا الأمر من أثر مباشر على قدرة الجيش والقوى الأمنية التي تسخّر كل قوتها وانتشارها لضبط الأوضاع مع تكرار الإعتداءات على الجيش ووقوع خسائر في أرواح جنوده وضباطه مما شكّل تحدّياً لدوره أدّى إلى سحب ونقل قواته من مهامها الأساسية في الجنوب إلى مناطق أخرى. ونظراً لانعكاس هذه الحالة وتلازمها مع تصعيد سياسي وانقسام يأخذ في كثير من الأحيان أبعاداً مذهبية وطائفية حادة تنذر تداعياتها بالفتنة التي أصبحت معالمها تنتقل من مكان لآخر وبأشكال متعددة. وبالاطلاع التفصيلي على أوضاع أكثر من منطقة لبنانية تظهر أن سلاح الفوضى يعبث بأمنها حيث يتجرّأ المسلحون على هز هيبة الدولة واستقرار حياة الناس وصولاً إلى إطلاق الصواريخ على المناطق التي تشكل امتداداً للعاصمة وكذلك مدينة طرابلس مع ما لهذا من انعكاس على صورة لبنان إضافةً إلىسقوط عشرات القتلى ومئات الجرحى، والقصف الصاروخي المتكرر على مدينة الهرمل. هذه الأوضاع الأمنية المتردية أدّت إلى أن العديد من الدول العربية والأجنبية نصحت رعاياها بمغادرة لبنان أو على الأقل عدم المجيء إليه إلا للضرورة القصوى. وبما أن مجمل هذا الوضع الأمني والسياسي المتوتر يعطل بشكل كبير إمكانية القيام بتحرك إنتخابي وتنظيم الحملات التي تسمح للمواطن وللمرشح بممارسة حقه في إطار القوانين والأنظمة وتعطل قدرة التواصل بينهما في أغلب المناطق وخاصة في المدن الكبرى ومنها وإليها. وتزامناً مع عدم الاستقرار الأمني هذا تأتي مشكلة غياب الاستقرار السياسي مع وجود حكومة مستقيلة. كل هذا انعكس وسينعكس مع استحقاق الانتخابات بشكل سلبي على القطاعات الاقتصادية والتجارية والسياحية المتعثرة وبما يؤدي إلى شلل إقتصادي يدفع اللبنانيون ثمنه مباشرةً. وبما أن معظم هذه الأمور السياسية والأمنية تتسم بصفات الظروف الاستثنائية والقوة القاهرة بأشد مفاهيمها. ولو سمحت الظروف لأي كان بالاستماع إلى وزيري الدفاع والداخلية وقادة الأجهزة لعرف بدقة حجم الصعوبات والأزمات التي يواجهونها والتي تتطلب المساعدة من الجميع. وبمـا أنـه صـدرت في لبنـان قوانيـن مـددت مـدة ولايـة المجلـس النيابـي لأكثر من مرة وهي القوانين رقـم 1/76 –3/78 –14/80 –9/83 – 3/84 – 11/86 – 52/87 – 1/1989 . وبمـا أن القوانيـن المذكـورة أعـلاه مـددت ولايـة المجلـس النيابـي تحـت وطـأة الحـرب والقـوة القاهـرةوالظروف الاستثنائية فإن اقتراح القانـون الذي نحن بصدده مـا هـو إلا لمنـع الحـرب واستدراك الفتنـة ونتائج الأزمـات الخطيـرة المحدقـة بنا. In case you didn’t understand a word, those were the compelling reasons (الاسباب الموجبة) that came with the previous extension law of 2013 (find the full text here). According to the text, the main reasons for the extension were that the security situation is unstable (There was the Qussair battle at the time) , that there is no political stability (Mikati’s government was a caretaker one at the time) and that there is no agreement on the electoral law. That headline is the Christmas miracle. The political class that wasted most of the 17 previous months on forming a government that could have been formed in 17 minutes instead of agreeing on an electoral law, and that successfully postponed the presidential elections and established vacancy in Baabda, now received what it had always wanted: Clashes, sectarianism and terrorism, all in a combo package. The other Christmas miracle was the decision of two Lebanese universities last week to postpone their student elections because of the security situation. Take it from the politicians’ point of view: If the universities can’t even hold elections in this context, how can the government organize them? By the end of this week, the three extension requirements were met. It was finally time to pass the parliamentary extension: (a) There was no political stability (no president), (b) there was no new electoral law to use (apparently 17 months aren’t enough to write a couple of consensual articles on a piece of paper), and (c) There were severe security breaches. Is it politically correct to say 3a2bel el miyye? 165 days since the 25th of May. One million years till the next parliamentary elections. Posted in 14 March Alliance, 8 March Alliance, Lebanese Politics, Monthly Presidential Coverage, Parliamentary Elections, Politics, Presidential Elections on November 5, 2014 by Ramez Dagher.